PALM DESERT (11-2-2018) – The Grossmont College men’s basketball team, which finished second behind state runner-up San Diego City in the Pacific Coast Athletic Conference last season, looks to improve on its 18-9 record from a year ago but got dinged in their 2018-19 season opener. Despite trailing the entire contest, the Griffins were never down by more than 8 points the entire way, closing to within 46-44 with 5:38 remaining. 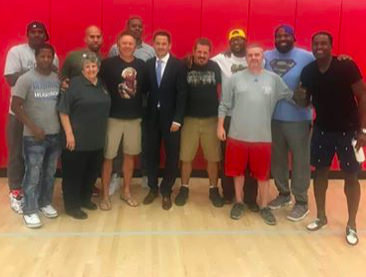 However, tournament host College of the Desert answered with a 3-ball and several foul shots down the stretch, nipping the G-House, 58-50, at the Frank Garcia Memorial Tournament. Garcia once guided the Roadrunners women’s basketball team to a state runner-up finish after leading the men’s program for more than 30 years. On, Thursday, College of the Desert won its season debut under new head coach Trent Skinner. Grossmont freshman Jamal Johnson (Granite Hills), who came off the bench to match fellow forward Josh Burton (Patrick Henry) for club scoring honors with 11 points, hit a driving layin to move the Griffins with two points. Marc Carrera (Canyon Country) garnered the assist. However, Desert guard Gunnar Mogolis answered with a 3-ball to re-stabilized the Roadrunners lead. Mogolis paced all scorers with 18 points, hitting 4-of-8 from beyond the arc. Conversely, the Griffins were a mere 1-for-13 from downtown. Grossmont moves on to the second round of the COD Tournament, meeting 8th-tanked San Bernardino Valley at 5 p.m. The Wolverines captured their opener, 81-75 over No. 14 Copper Mountain. Griffin Graffiti (from GC Press Release): Over the past 20 years, one of the goals for Grossmont College head men’s basketball coach Doug Weber and his staff has been to help Griffins basketball players receive scholarships and move on to four-year institutions to continue their playing careers. Palomar 74, Cuyamaca 62 – Comets guard Jamario Harris hoisted the ball for a game-high 22 points to pace Palomar past the Coyotes at the Miramar College Tournament. A rebounding advantage of 41-32 kept the visitors from San Marcos ahead most of the way. Cuyamaca, which has won just 20 games over the past four seasons (5.0 average) hopes to avoid repeating last season’s 1-23 mark. Twelve players hit the scoresheet, but only Chris Stanek (Otay Ranch) could muster double figures with 12 points. Miramar 91, Rio Hondo 85 – Coming off a pair of 20-victory seasons, the Jets opened the season by rushing over the Roadrunners from Whittier at their own tournament in Mira Mesa. Four starters for Miramar scored in double figures, including a game-best 25 points by Blake Seits, while Carsten DenHerder| added 21 points on 7-of-11 shooting in just 24 minutes of court time. Santa Monica 77, Southwestern 67 – Jaguars starting guard Jose Serrano (Balboa Prep) scored a club-high 13 points, a total matched by teammate Marc Combs from off the bench, but Southwestern fell to the state-ranked Corsairs at the Miramar Tournament. The Jags’ starting quintet shot a mere 27 percent (9-for-33) from the floor, while the reserves did better at 12-for-33. However, Southwestern stayed in the ballgame throughout by forcing 26 Santa Monica turnovers. SWC freshman Nikko Paranada (Foothills Christian) added 4 points. Imperial Valley 84, MiraCosta 77 – In the final Miramar Tournament contests, the Arabs mounted a 7-point halftime lead to vanquish the Spartans of Oceanside. Forward Terry Daniels tallied a game-high 17 points for Imperial Valley. MiraCosta saw center Devyian Roberson also register 17 points, but poor foul shooting (15-for-30) doomed the Spartans.